MINOT, N.D. – When Minot State University alumni Kevin Burckhard began working for Northwestern Mutual, he had bangs and wasn’t of legal drinking age. 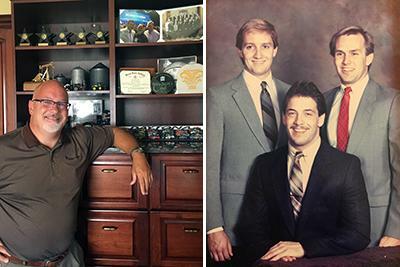 Thirty-three years later, now a financial advisor, he shares these details with clients to emphasize his longevity with the company — a career that started with an internship opportunity early in his academic career. “I had decided I wanted to do well enough at this internship that as graduation came, I could just transition from a part-time contract to a full-time contract. I was self-employed as an intern and I’ve been self-employed ever since,” Burckhard said. Minot State’s 21st Century Workforce Development campaign is a new initiative driven with the purpose of providing more students with opportunities like Burckhard’s. The campaign involves faculty and staff coordinating with business leaders like Burckhard and companies like Northwestern Mutual to create speaker networks, mentoring, internships, job shadowing, and employment opportunities for students throughout their academic career. For Burckhard, the internship became the essential link between college and career. “In almost every class that I took I could see (how) this could help me be a better advisor to my clients, this will help me be a more empathetic listener, this will be something that will help me be intentional about how I follow up; my grades went up not because I all of the sudden became a better student—my grades went up because I started to relate that this is how this will help me in this career that I think I’m going to do for the rest of my life,” Burckhard said. These meaningful experiences like mentoring and internship, according to a recent Gallup-Purdue survey, increase a student’s likeliness to engage at work and thrive in areas of social, financial, physical, and community well-being as well as finding individual purpose. But, Burckhard said, if students gain some meaningful real-life experiences early in their college careers, they have the opportunity to assess whether they’re making the right choice, and if not, there’s still time to change career goals and academic plans. Burckhard estimates 250 Minot State students have gone through Northwestern Mutual’s internship during his time with the company.